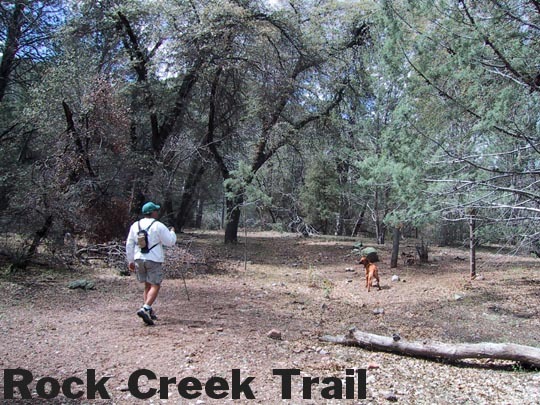 This is a beautiful loop hike that takes you through some of the least traveled trails in the far eastern Superstition Wilderness. Parts of this hike are through the most forested areas of the Superstitions I have seen yet, but there was one down side. Although the route remains exclusively on established Forest Service trails, there were some areas that were completely overgrown resulting in a major bushwhack. Needless to say this was completely unanticipated, as my continual apologies to my neighbor who I drug along will attest. 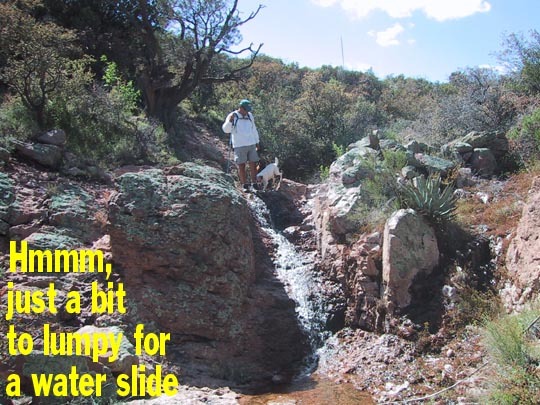 Actually he had a great time, and hoping that they will eventually clear the trail, I would highly recommend this hike. The itinerary is rather confusing, but it begins at Miles Trailhead and proceeds counter clockwise (west) on West Pinto Trail to Rock Creek Trail to Bull Basin Trail to Haunted Canyon Trail and then finally back on Paradise Trail (all intersections are signed). The trail heads out west along scenic W.Pinto Creek and the area to your right is a large flat grassy basin with many signs of the old Kennedy cattle ranch. This peaceful walk along the creek under large Sycamores and Junipers goes on for .6mi until you reach the intersection with Rock Creek Trail. The terrain gradually closes in until you are beginning a climb up a narrow forested ravine. After .7mi you will reach Bull Basin Trail where you will begin the first of the two rather strenuous climbs on this loop. As you start your climb up Bull Basin, you will notice two things. One, the flora changes from predominately forest to bush. The Manzanita is gorgeous along this area. The other thing you may notice is the trail is becoming less defined and you're having to occasionally push branches aside. This is an evil portent of things to come. We're now ready to begin our descent into Haunted Canyon. The trail begins a series of switchbacks down to the creek bed where you will eventually come across two old springs (both set up for cattle) that are now in disrepair. The first of these is Javalina Springs, and here begins a maddening area where you'll swear (both literally and figuratively) at times the trail just goes from a "freeway" to zero in two steps. "What the hey!?!?" Usually its a matter of bulldozing through a wall of bush just to see the "freeway" once again miraculously appear (if only briefly) in this endless twilight zone of the never ending bushwhack maze. "Mister Wizard!!" (for those of you old enough to remember). At this point I was totally amazed that there was not the slightest sign that anyone had been through there in my lifetime. Please somebody write me and tell me that not twenty feet away was the "true" trail and I just happened to be cruelly paralleling it all the way down. Two things keep you going here, one - its simply beautiful, and the other is you have to get back and you'll be darned if you're gonna go back through what you just came through. A good judgment? Welllll? Basically, yes. The whacking continues pretty much all the way down to the Haunted Canyon intersection where the trail mercifully returns to that sweet open forest style. A note of caution: take a "hard" left at the intersection, the signs are little deceiving. Haunted Can). But, alas, you're not quite out of the thicket yet. At about the 7mi point most of the way up the climb you'll come to Paradise Trail (you'll initially think its anything but). Go left and as you crest the pass, believe it or not, you will once again need to descend into that god forsaken bramble. We initially tried to take what appeared as the most worn path and it took us to the left on what I believe is an old trail to the top of Gov't Mt. You must go against all desires and descend directly into the ravine. 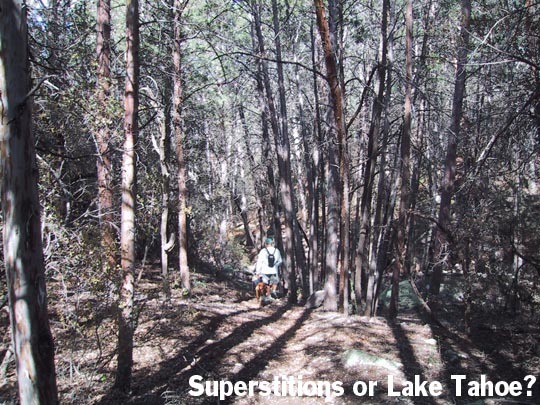 Staying on the right bank you'll barely be able to discern that there is indeed a ghost of a trail there somewhere. The fortunate thing is that this last torment is rather short lived. Soon the trail begins to open into one of the most beautiful areas I've seen in the Supes. The last two miles of the hike are indeed a well deserved paradise. Much of the scenery is more reminiscent of Lake Tahoe than Arizona. The trees are immense and thick in this ancient forest along the stream. (see Cheese pic) In addition to that its all downhill combining into a wonderful finish to this hike. 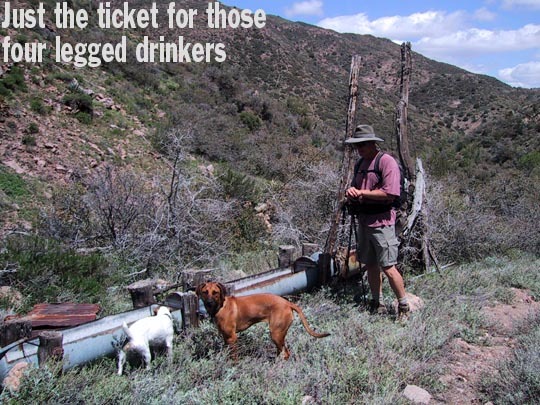 If more people would hike these trails, that alone would probably help a lot (so get out there and do your part!) I called the Globe office of the Forest Dept. and they said they'll eventually get around to clearing it and if they do it soon enough, they might even be able to find it! If it were cleared I believe you could possibly cut almost an hour off the hiking time. In the interest of artistic license, I probably exaggerated the downside. Therefore, in all truthfulness, I must again reiterate that above all was the overwhelming beauty and solitude of the entire area, making for an overall outstanding hike. From Superior head out east on US 60. Pass through the Queen Creek Tunnel and continue 10 miles to mile marker 239.4 Turn left onto this paved road that enters the Pinto Mine. Follow the paved road 2.8 miles and turn left onto FS 287. Go slow at the numerous intersections. Your goal is to figure out which are mine roads and which are public access. Public access signs are posted on most of the intersections. Some aren't exactly clear which way they are pointing. 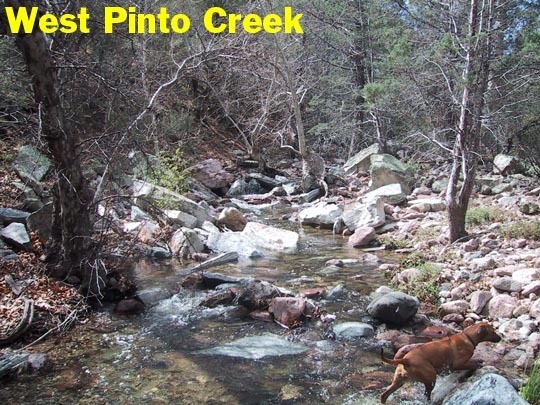 You will leave the private land of the Pinto Mine and crossover onto forest land. At about seven miles you turn left onto 287A. Follow FS 287A to the end. 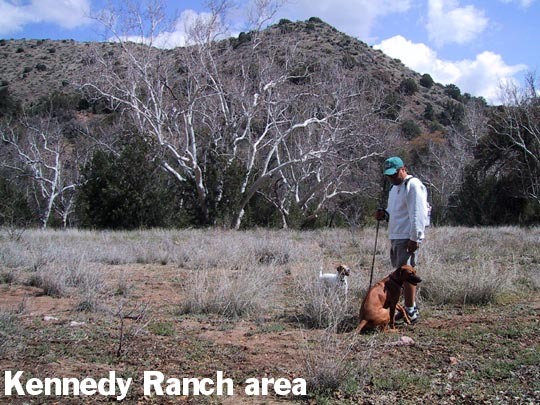 It's called Kennedy Ranch on maps, but the trailhead is called Miles Ranch.